Published on 14. 04. 2014 in interviews and pictorial arts. Closed Tags: Artibus et Historiae, Julius II, Leonardo, Peter Humfrey, Raphael. Michelangelo, Titian. No, these aren't the caricature mentioned, but they're also by Titian (and/or his assistants), and they're on the back of the Ancona Pala Gozzi. The article examines drawings found on the back of the canvas of the recently surfaced Portrait of a Man (Girolamo Cornaro?) painted by Titian around 1511–1512. 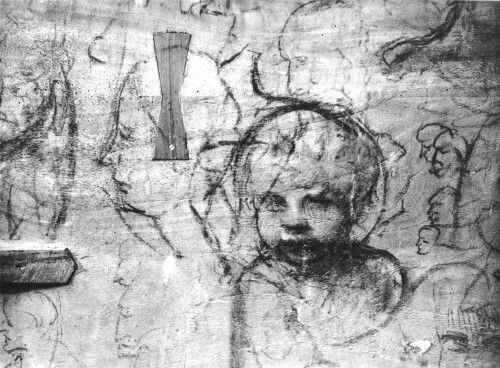 Drawn with the point of the brush, they depict a large head in proﬁ le and two smaller ﬁgures. Loose and broad in execution, at least the former belongs to the domain of caricature. By comparison with similar drawings, on paper as well as the versos of other paintings, the drawings are here attributed to Titian. Further, the possibility that the head might be a portrayal of Michelangelo is explored, as is its value as evidence of the reception of Michelangelo’s outsize public stature and self-fashioning as an imperfect, Socratic artist whose work carried palpable overtones of the grotesque. The two ﬁgure studies, in themselves acutely Michelangelesque, are related to inventions by other contemporaries. Next, the fact that the caricature wears a beard, but no moustache, occasions an excursus on contemporary facial hair generally and speciﬁcally that of Michelangelo’s patron, Julius II. Ecclesiastical beards were a controversial issue at the time, and shaving one’s upper lip carried liturgical signiﬁcance. Julius was the ﬁ rst Renaissance pope to grow a beard, as is famously charted by Raphael in his portraits of him in the Vatican frescoes and elsewhere. By focusing on the depiction of his beard, the article sheds new light on the iconography of these pictures and potentially their confused chronology. Lastly, Titian’s drawings are examined in the context of contemporary grotesques with reference to Leonardo’s explorations of exaggerated physiognomies. On this basis, it proposes a reevaluation of Renaissance caricature. The issue is second of two dedicated to Professor Peter Humfrey in his retirement. I am very happy to thus take part in the celebration! Artibus et Historiae vol. 68 is available now in a specialist library near you!